Looking to maximize your level of fitness and achieve your goals in a timely manner? It might be time to consider hiring a personal trainer! While there is a common misconception that personal training is only for the “rich and famous”, the truth is that personal trainers are used by people of all ages and fitness levels and across varied income levels as it is proven to be a highly effective and successful way to improve your health and fitness. Whether you are looking to lose weight, build muscle, recover fully from an injury or just improve your overall fitness, a personal trainer can provide you with the support and knowledge you need to achieve your goals. 1. Improving Your Overall Fitness – the number one reason that people hire personal trainers is to get professional assistance to improve cardiovascular health, strength, flexibility, endurance, posture, balance and coordination. A personal trainer will develop a program that is tailored to your individual needs and will then monitor your progress and fine-tune your program as you go. 2. Reaching or Maintaining a Healthy Weight – Weight loss or weight management and toning can all be achieved with the assistance of a qualified personal trainer who can help you set safe and realistic goals while providing the encouragement you need to keep you on track with your program. 3. Learning to Stick to It – Sticking with the plans that you have set for yourself can be one of the biggest challenges exercisers face. Qualified personal trainers can provide motivation for developing a lifestyle that places a high priority on health and activity. A personal trainer can help you brainstorm ways to overcome your biggest obstacles to exercise and to make physical activity a regular part of your daily life. 4. Focusing on Your Unique Health Concerns – For clients who have special medical issues such as arthritis, diabetes or obesity, or are recovering from an injury, a qualified personal trainer can work along with your health care providers to give you guidance on how to exercise while living with these issues. Your personal trainer can work with your physician, physical therapist or other health care provider to plan a safe, efficient program that will speed your recovery or enable you to reach your health goals. 5. Teaching You Proper Technique – When working with a trainer, you will learn the correct way to use equipment, and the appropriate form and technique for cardiovascular work and free-weight training as well as the appropriate intensity level for achieving your personal goals. 6. Avoiding Wasting Time – Get maximum results in minimum time with a program designed specifically for you. Workouts that use your strengths and improve on your weaknesses are efficient and effective. A trainer can give you guidance on how to get the most out of your workout in the shortest amount of time. 7. Learning New Skills – Whether you are looking to improve your tennis game, learn to ski, improve your golf game or hockey skills or get ready for a hiking adventure, an individualized program can improve your overall conditioning and develop the specific skills you need to achieve your goals and excel at your sport or skill. 8. Enhancing Your Mind, Body and Spirit – A personal trainer can guide you to new personal growth experiences. Many personal trainers provide mind-body activities, such as yoga or tai chi sessions or can refer you to someone who offers these services. 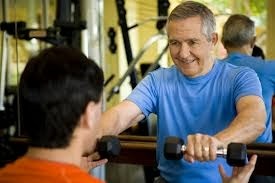 Your personal trainer may help you uncover new insights about yourself or find potential you didn’t realize you had. 9. Offering You the Benefit From the Buddy System – What could be better than making a commitment to regularly meet with someone who will provide you with individualized attention and support? You are much more likely to stick to your program when you have someone guiding you along and holding you accountable every step of the way. 10. Teaching you to Take Charge of Your Program – With the right personal trainer, you can find the exercise program that works best for you. Are you someone who likes an intense program or prefers a gentler approach? Would you like to train at home or at work, in a gym or in a personal training studio? How many times per week or month do you want to meet your personal trainer, and for how long? Carefully choosing a personal trainer enables you to select the type of guidance that will benefit you. You can get fit and healthy your way and take ultimate responsibility for your own health. These are some of the many benefits you will see when working with the personal trainer who is right for you. If you decide to move forward with hiring a trainer, be sure that you are working with someone who is certified and has kept their certification up to date. If you have special health issues, also ensure that the person you are working with is both qualified and has experience with your particular issues and that they are working closely with your health care provider. Working with a personal trainer can be an extremely rewarding experience that can help you achieve the success you are seeking in a timely manner while having fun doing it! If you are ready to see results, make the call today to connect with a trainer who can help you along the way.